The far side of the moon will get a special new crater later this month when a NASA spacecraft makes a high-speed crash into the lunar surface. NASA's moon-orbiting LADEE probe (short for Lunar Atmosphere and Dust Environment Explorer) is expected to impact Earth's natural satellite sometime on or before April 21. The LADEE spacecraft has been studying the moon's thin atmosphere — called an exosphere — and the lunar dust environment since it began orbiting the moon in October. NASA's Lunar Reconnaissance Orbiter (another probe circling the moon) could look for LADEE's crash site after impact, said Butler Hine, LADEE project manager. Before the $280 million LADEE mission meets its ultimate fate, the vending-machine-size probe still has some scientific work to do. Although the probe's primary mission — to explore the moon's thin atmosphere and dust environment — is complete, scientists still want to see what the spacecraft can uncover about lunar dust from only a few kilometers above the moon's surface. "The moon's gravity field is so lumpy, and the terrain is so highly variable, with crater ridges and valleys, that frequent maneuvers are required, or the LADEE spacecraft will impact the moon’s surface," Hine said in a statement. "Even if we perform all maneuvers perfectly, there's still a chance LADEE could impact the moon sometime before April 21, which is when we expect LADEE's orbit to naturally decay after using all the fuel onboard." Scientists think the glimmer could have been caused by lunar dust lofted into the exosphere, but for its part, LADEE hasn't recorded dust concentrations from its orbit that would create that horizon glow, Elphic said. The probe will get a chance to explore it further before crashing into the lunar surface when it uses its orientation cameras to try to see what the Apollo astronauts saw. 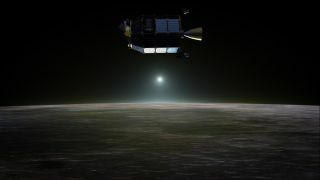 "One of the things we're going to try to do is replicate that observation by [astronaut] Gene Cernan on [Apollo] 17 long ago by pointing the star tracker out in exactly the same sort of arrangement, waiting for the sun to come up and taking a look at what the star trackers reveal to us as we approach orbital sunrise," Elphic said. Assuming it hasn't crashed, LADEE will also fly through a lunar eclipse on April 15, testing the spacecraft to its limits, NASA officials said. The Earth's shadow will pass over the moon, making it very cold for the probe during the four hours of the eclipse. "We're very eager to see how LADEE handles the prolonged exposure to the intense cold of this eclipse, and we've used flight data to predict that most of the spacecraft should be fine," said Hine. "However, the eclipse will really put the spacecraft design through an extreme test, especially the propulsion system."